Air Turks and Caicos interCaribbean Airways, Ltd. (formerly known as Air Turks & Caicos) is a passenger airline based in the Turks and Caicos Islands. 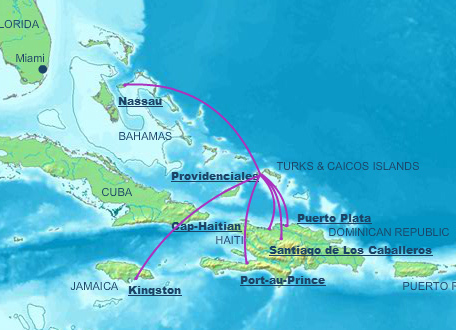 The airline offers scheduled domestic and regional services from its hub at Providenciales, Turks & Caicos and Tortola, British Virgin Islands, to multiple destinations in Antigua, The Bahamas, British Virgin Islands, Cuba, Dominica, Dominican Republic, Haiti, Jamaica, Puerto Rico, St. Lucia and St. Maarten. interCaribbean Airways also operates domestic flights in Jamaica between Kingston and Montego Bay, the first non Jamaican airline in over 50 years of Jamaica independence to be given such route rights. The company provides charter flights as well.